Day Twenty: Education: Who was your favorite teacher? 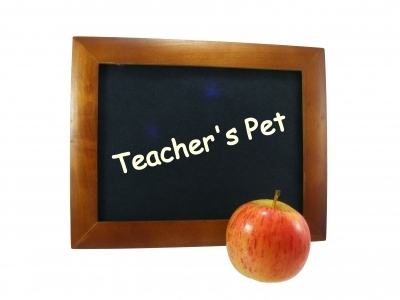 Explain what made that teacher likable and why you are grateful for being taught him or her? What did you learn from that teacher? Posted in 30 Days of Gratitude and tagged 30 days of gratitude, childhood, day twenty, diary, education, favorite, favorite teacher, gratitude, journal, kids, learning, postaday, prompt, school, teacher's pet, teachers, thankfulness, writing, writing prompt. Bookmark the permalink. I have had many teachers in my long education process, but the one teacher that made the biggest impression on me was the one my friends and I called, “MegaBeast”. I know, I know, that is horrible! The MegaBeast was my English teacher, and I had to learn while I was in her class. If I could not stand up and recite my prepositions correctly, she would poke me. She literally had me shaking in my shoes. Despite the fear, I felt in her presence, she was the best teacher I have ever had in my life. Her MegaBeast persistence created in me a desire to write, read, and teach. It is because of her I am an English and Reading teacher, today. I owe the MegaBeast a great deal of gratitude. She taught me to work hard and do my best. She helps me daily, even if she does not know it, to do my life’s work.